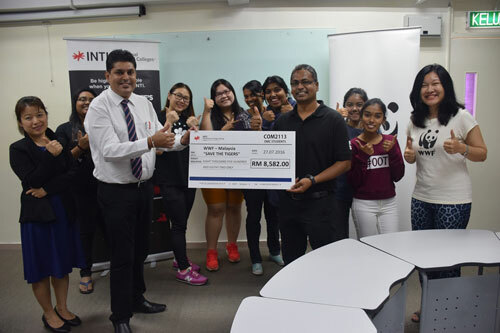 The fund-raising project is part of the students’ Employer Project – an initiative to connect INTI students with real life employers and organization was collected over a series of activities and awareness campaign initiated by the Diploma in Mass Communication students. Activities such as hand painting and selling merchandises that improved social awareness on the tigers were carried out. The final year students also designed and sold t-shirts that bore the images of tigers. “One of our main objectives is to improve the awareness about the tigers. We believed that improving the knowledge of our peers about how important it is to save the tigers and its importance to the flora and fauna is one of the best ways to carry out the project,” said Thismehni, 20, one of the Mass Communication students involved in the project. The students were also pleasantly surprised by additional information on tiger conservation from WWF-Malaysia’s Tiger Landscape Lead of the Peninsular Malaysia Terrestrial Conservation, notable tiger biologist Dr Mark Rayan, during the cheque presentation. “This donation will help enable our Wildlife Warriors to undertake crucial activities to conserve our tigers. They spend months in the forests to try to understand how tigers are faring in the wild. 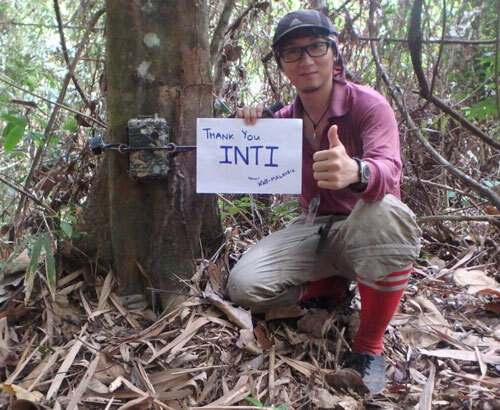 They use ‘camera traps’ – a device used to photograph wild animals, especially tigers using heat motion sensors placed in the Belum-Temengor Forest Complex. As we compile more photographs, more data will be made available and we will then be able to study their population ecology. Therefore, I hope you understand the impact that you will be making through this donation,” said Dr Mark. INTI’s collaboration with WWF-Malaysia was made all the more relevant as it aligned classroom learning with actual hands-on practice of subjects being taught focusing on business, advertising, economics and creative thinking skills were selected to carry out the projects, creating a holistic understanding for students spanning theory to practice. Through INTI’s close ties with over 400 employer partners, INTI provides various platforms for students to gain industry relevant skills and experiences. Students also have the opportunity to work with industry partners on projects that may have actual and immediate impact on participating companies, which enable students to develop and enhance 21st century skills which are creativity, communication, critical thinking and collaboration. Working with industry and learning through innovative means have resulted in 78% of INTI graduates earning a higher salary than the market average and 97% securing employment within six months of graduation.